Thanks for spreading the word. Also please note that I’ve updated the Handbook with information on newest versions of the Sturmey-Archer AWC and S-RC3 hubs. 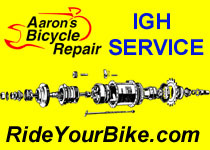 You will also find technical information on the site — or linked to manufacturers’ sites — about newer (and older) hubs from Sturmey-Archer, Sachs/SRAM and Shimano, and on all c9ommon coaster brakes. We are still looking for information on the Shimano Alfine 11-speed and SRAM 8-speed! I haven’t had an excuse to open up my Alfine 11, but I have posted a link to some images of the oil change process on the Alfine thread.